Let’s begins with the big one: D’Agostino’s Relentless monoblock power amp was on proud static display (behind red velvet ropes, no less). It’s rated at 1500W (clips at 1640W into 8 ohms) and is said to have no drop in rail voltage to output stage at any power output. Its fully balanced topology cancels distortion, which is 0.006% at full output power. The behemoth boasts 100 output transistors per amp and stays in Class A up to 100W before shifting to Class AB. The new design, which Dan began work on two years ago, has no global feedback and offers 600,000 microfarads of filter capacitance in an acoustic damping chamber. The amp’s front-end circuitry is completely isolated from later stages. Naturally the massive chassis—these babies weigh 500 pounds each—is pure D’Agostino in its signature styling, and features custom solid brass binding posts also designed by Dan. The price tag for these beauts is also hefty; then again, this must be the statement amp to beat. Delivery is expected by July. There’s also a three-chassis Relentless preamp in the works. 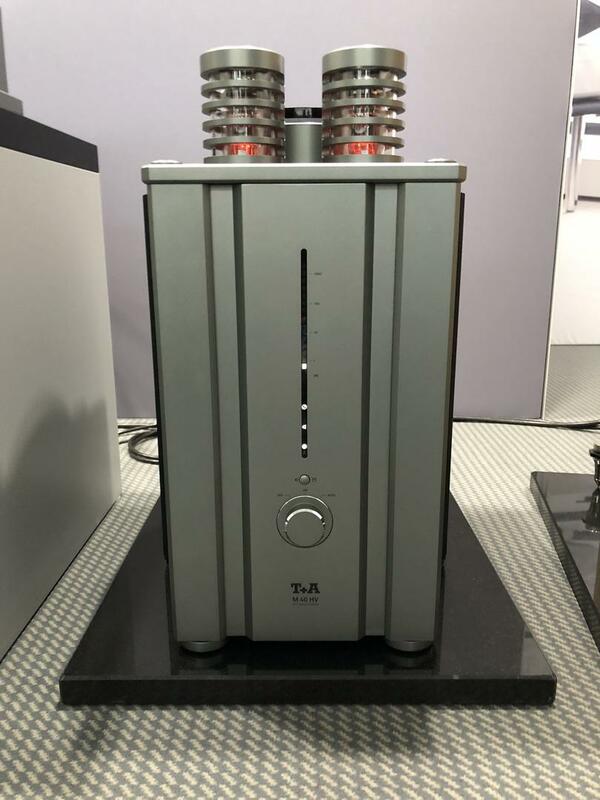 T+A of Germany introduced a limited edition M 40 HV monoblock amplifier to commemorate the manufacturer’s 40th anniversary. Marking an extension to T+A’s HV series, the first M 40 models were on static and, at times, active display at the show. The amp is a high-powered hybrid design with 6SN7 tubes in the input/gain stage, which is designed as a symmetrical differential amplifier with an all-valve cascode circuit and is completely isolated from the power section, and an output stage using high-voltage Class A J-FET circuitry. Though the M 40 HV delivers 1000W into 4 ohms and its transformers provide a total capacity of more than 180,000 microfarads, it is reported to offer such high levels of linearity and bandwidth that it eschews the use of negative feedback. In high current mode (according to specs), the amps can deliver up to 60W of pure Class A power and up to 250W Class AB. Some notable features on the amp’s stately appearance: The solid aluminum heatsinks are nicely integrated on either side of the M 40’s overall vertical chassis, and at the top, the pair of tubes are housed within elegantly machined, space-age-looking protective “cages.” These hefty powerhouses require 2500W of mains power and will retail for $29.5k/pr. in the U.S. Shipping begins mid-year, but get ’em while they’re hot: They’re reportedly only going to be available for the duration of 2018. 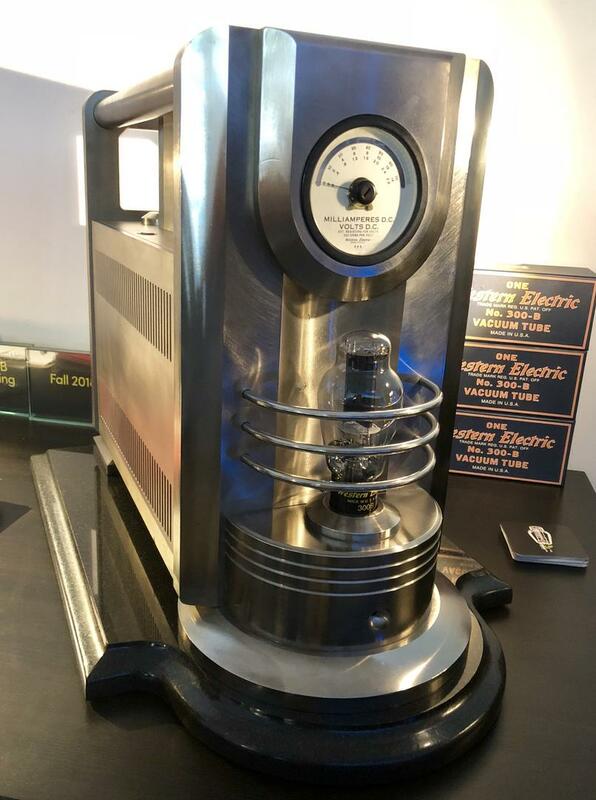 From Western Electric—the marque that pioneered not only tubes but also talkies (for the young ’uns, those were the first films with sound)—comes a resurrection not only of Western Electric 300B tubes, which are due out in September, but also new audio electronics, including the $40k/pr. offering in my price category: the Western Electric WE 91C “Metropolis” monoblocks featuring 300Bs. Made in Chattanooga, TN, the amp delivers 22 watts of power per side (instead of the 8W of the old-school predecessor model) and is a limited edition of only 1000 pairs worldwide. The retro-styled amp’s moniker is a nod to Fritz Lang’s 1927 Weimar German film of the same name. 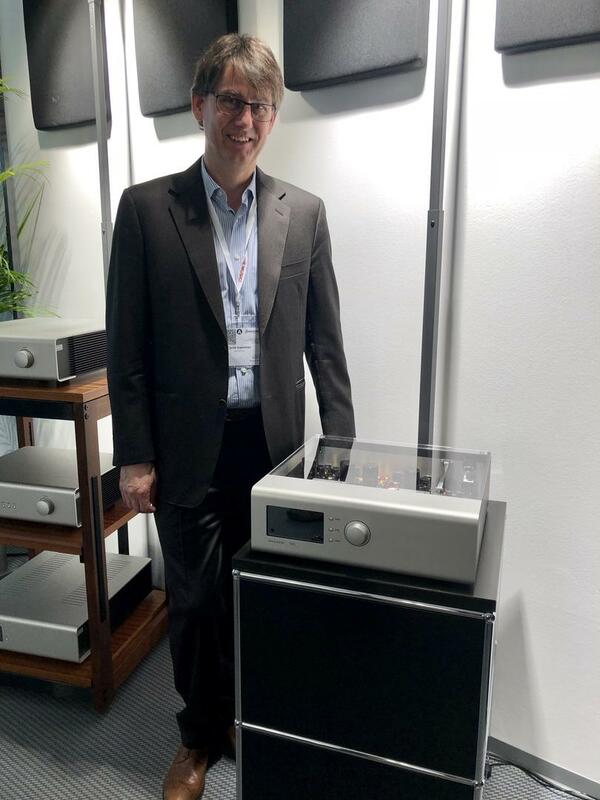 Sharing demo room space with Western Electric components, Westend Audio Systems is a new company led by Stefan Trog that hand-builds its strikingly designed gear in Munich. It’s no coincidence that the two showed together; Westend electronics feature Western Electric tubes. Westend’s 100W Monaco stereo amplifier (approx. €24k/$30k) uses E130L tubes in a push-pull topology inside a flashy chrome or shiny gold-colored chassis. The Monaco also boasts a showy and technically sophisticated display of a five-step check process: It measures for possible short circuits or other PCB errors inside, then heats the cathodes and increases their voltage gradually, switches on the 630W anode voltage and measures current, then auto-biases the valves. A series of lights surrounding the center dial on the chassis displays the progress of these steps towards perfect push-pull alignment. When the sequence completes, all is stable and you’re SET to go. Also introduced was Westend’s Leo integrated amp (est. €10k) that employs Western Electric 300B SETs to deliver 20W in all-modern fashion; its release is slated for Q3. The company is in final talks for entering the U.S. market (expected later this year) and its products will be sold dealer-direct. Cyrill Hammer of Soulution has pushed forward the state of the art in amplification though his innovative use of negative feedback, among other technical developments. It sounds like he’s has done it again with his new Soulution 525 linestage preamplifier. This new model marks an upgrade from the prior 520 with performance that nets out better than the 5 and the 7 series, says Cyrill. The 525 features an all-new fully balanced input stage and a unique instrumentation amplifier that offers advantages such as reduced noise, and lower distortion and common-mode rejection. There’s a new switch-mode power supply with high-precision linear regulation stages, in addition to massive filtering for far lower noise and greater stability over prior designs with transformers. Volume control is similar to that of the 7 series with its switch-relay resistors, and the ultra-wideband output stage, made to drive long cables, has also been upgraded in parts used. The Soulution 525 preamp was employed early in the chain within a setup of Soulution electronics driving Rockport Lyra loudspeakers ($170k). A DeBaer turntable served as the analog source; Critical Mass Systems provided the top-tier racks and CenterStage feet, and wiring was from Vovox. Coupled with some midrange emphasis, energy and power proved to be strong suits; rock ’n’ roll played well here. The system also showcased the Soulution electronics’ reliable bloom and resolution combined with grip and muscle on the selections from the first side of Pink Floyd’s The Wall, for instance. Following “Another Brick in the Wall, Part 1,” the sound of the helicopter blades tore between the channels with compelling weight; percussion, particularly on the downbeats, was hard-hitting. Production for the 525 is slated to begin mid-year, and the U.S. price is $25k. 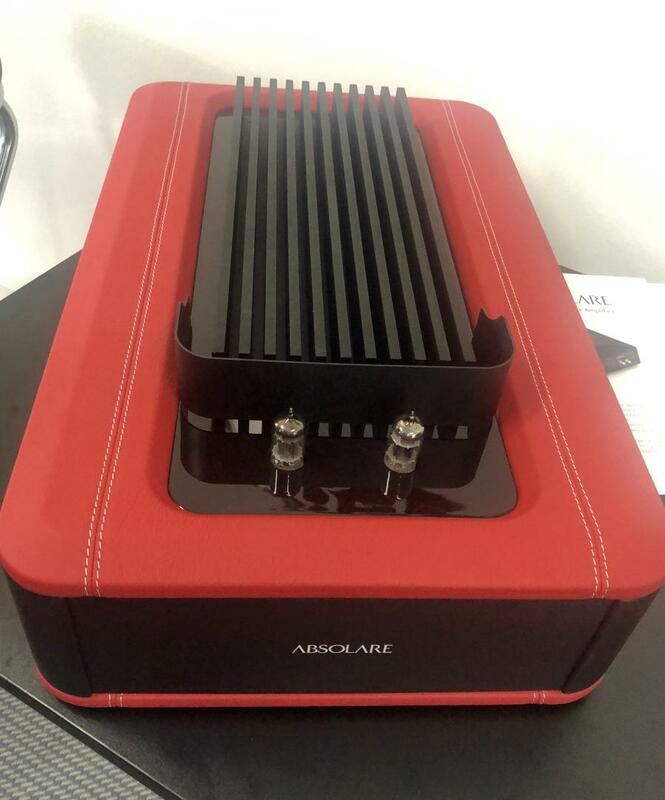 Ensconced in smooth crimson leather with top-stitching details, the Absolare Passion hybrid monoblock amplifiers ($60k/pr.) look as warm, sensual, and luxe as they sound. (See also Robert Harley’s review of the Passion integrated amplifier). These unique designs deliver 300W into 4 ohms (and 200W into 8) and feature a hybrid architecture with a tube input stage and a solid-state output stage, high and low gain settings (30dB and 24dB, respectively). 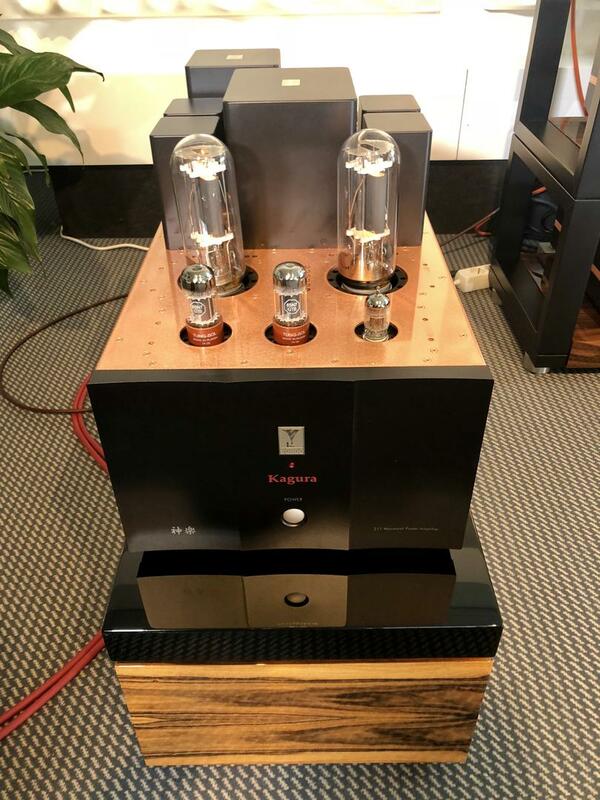 In an inviting demo with an Absolare Altius phonostage ($52k) and Altius preamplifier ($50k), all in front of Rockport Lyra loudspeakers ($170k), the rich bottom-up presentation enveloped you in roundedness and full-bodied presence. Listening to JV’s Analogue Productions reissue of Satchmo Plays King Oliver it sounded as though Louis Armstrong and his trumpet had been summoned to emerge from the extremely quiet background. Although not the pinnacle of transparency, this was a system that engaged the ears (and eyes) and was easy to love. 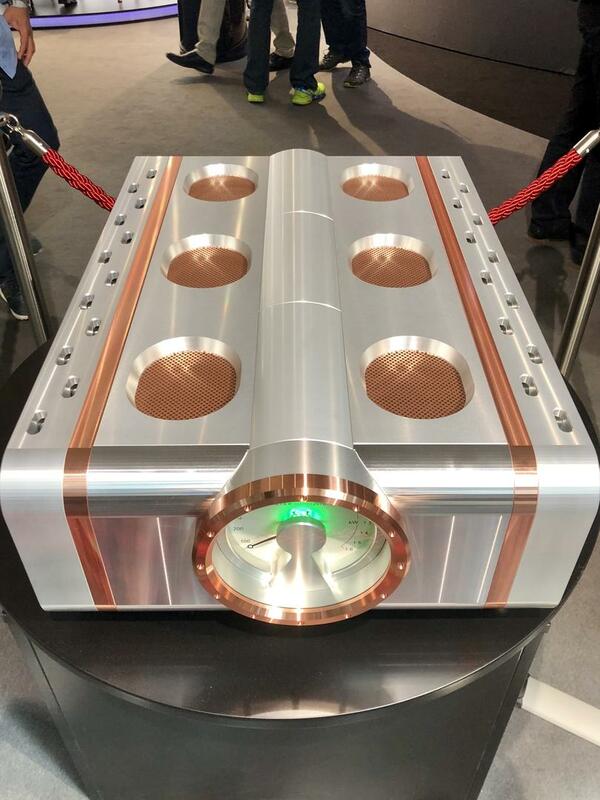 Berlin-based Burmester unveiled its 159 power amplifier that, along with the BC350 speakers, represented the inaugural components in the company’s new Signature Line. 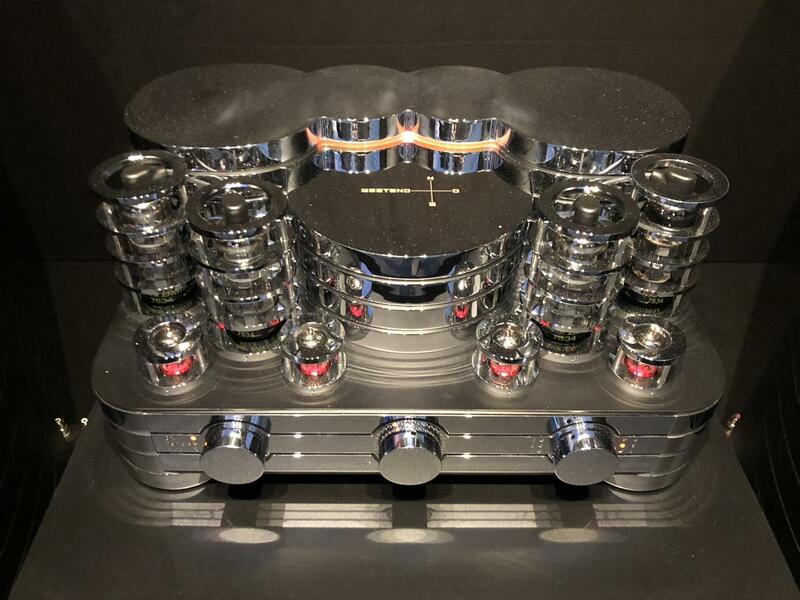 Billed as “the greatest power amplifier in the history of the company,” the 159 required seven years of development and marks the first dedicated monoblock Burmester has created since the Eighties. The 159 delivers 1200W of power (into 4 ohms) and offers an adjustable damping factor allowing listeners to tweak the amplifier—via a rotary encoder on the rear of the chassis—for sonic preferences and various speaker requirements. The amp’s hefty power reserves are monitored in real time by an analog computer. Another techy feature: The 159 contains new patent-pending technology for thermally optimized circuit design; the amp reaches its optimum temperature points within seconds and maintains them regardless of operating temperatures, so no warm-up time is needed. As befits all Burmester products, the lines and form factor are clean and elegant. The Burmester 159 Mono Power Amplifier will retail for €148k and delivery is scheduled to begin in December 2018. Holger Stein, the mind behind Stein Music’s plethora of fine audio products—from a line of extraordinary horn-hybrid loudspeakers and solid-state electronics to unusual vinyl accessories and room-treatment products, such as Harmonizer boxes that use crystals—presented new amp and preamp offerings for his State Line and High Line electronics, for my assigned category including the High Line Amp1 integrated (€12.8k) that delivers 120Wpc from a completely balanced internal structure; its preamp section operates without the use of any feedback. 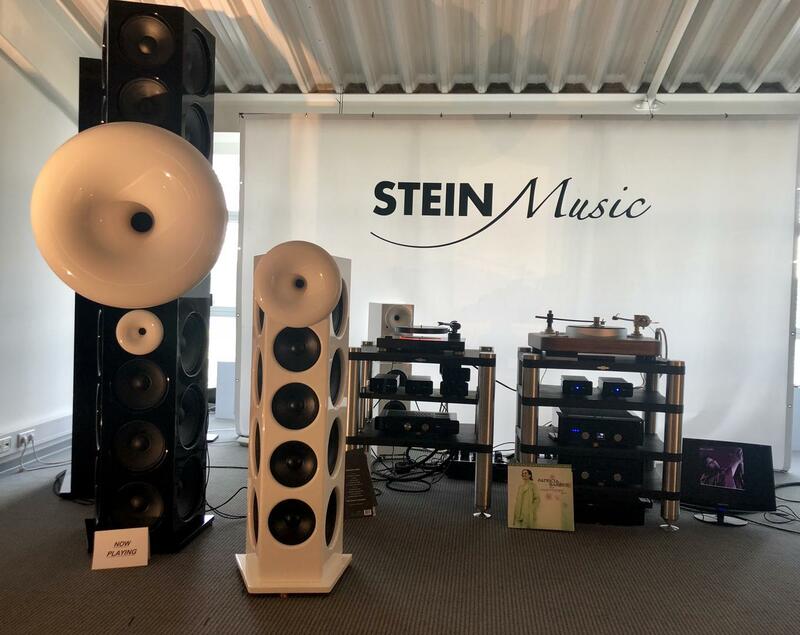 A listen to his demo system where Stein electronics drove his large-scale black-and-white Top Line Bob-XL speakers (€128k) was an absolute sonic delight—across diverse musical selections—with quick and nimble transient attacks, and high resolution, remarkable coherence, texture, and dimension. The title track on The National’s Sleep Well Beast (the 2018 Grammy Award winner for Best Alternative Music Album)—a quirky and compelling cut—was rendered seamlessly with appropriate measures of weight (from the top end to bottom octaves), instrumental and vocal layering, and delicacy of detail. The funky grooves on “In the Ghetto” were oh-so-tight with excellent speed and snap. Chet Baker singing “That Old Feeling” sounded so cool, so seamless, and as smooth as the speaker horn's surfaces. Coinciding with the Berlin-based company’s tenth anniversary, the new Voxativ T805 integrated amp ($29,880) delivers 30Wpc—three times the power of the prior T211 integrated, whose chassis is still employed here. Other improvements include a redesigned 12AX7 tube approach, a new (outboard) power supply, and a more powerful driver stage; the KT66 in the driver stage is a pentode but runs in triode mode. Unsurprisingly the T805 proved to be a perfect match for the high-efficiency Voxativ 9.87 speaker system, where music was reproduced with lively yet effortless dynamics, fast and exciting attacks, and plenty of bloom and detail. Digital source was a Weiss Medus DAC with Weiss MAN 301 server. 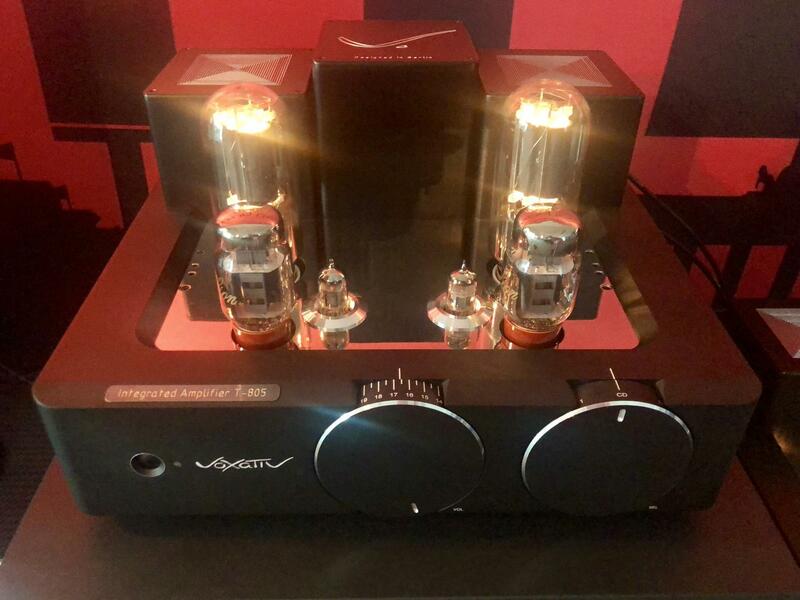 Another example of the resurgence of the WE 300B tube: Thrax introduced its Spartacus 300 monoblock amp (€68,016/pr.) with six 300B valves used in two stages delivering 50W of Class A power. The triodes are directly heated with modern magnetic materials, and the statement amp also features a nano-crystalline core output transformer and nano-crystalline choke power supply. Alas, I didn’t get to hear these glass-bottle beauties as they had been moved to static display. Danish electronics manufacturer Vitus introduced an addition to its Reference line, the RI-101 integrated, which follows the acclaimed RI-100 and retains that model’s power and output stages. According to Vitus, “significant” updates have been made to the power amp in RI-101’s input stage, and the preamp section contains major upgrades resulting in a lower noise floor for blacker backgrounds and greater resolution (also from implementation of the better volume control seen in the SL-103 and MP-L201 models). Options include USB, RCA, XLR, and TosLink inputs and up to 2x DSD via USB; an extended DAC/streamer board is forthcoming midyear. Alongside its rather unexpected turntable and loudspeaker debuts, AVM of Germany debuted a modular preamplifier, the PA 8.2, for which customers can select from a wide array of options: tube or solid-state output stages, in addition to myriad modules including phono, digital, Bluetooth, home theater, and more. The YS Sound 782 preamplifier is new in the market and the 772 monoblocks that debuted at the High End Munich Show last year in prototype form are now in production. A great sonic pairing for the Zellaton Statement speakers demo’d at the show, these exotic—and yes, quite expensive—electronics from YS Sound—are hand-built in Japan and pack plenty of power in gorgeous chassis. Audio Note of Japan launched its 20W Kondo Gakuoh II monoblock amplifiers (€160k) that employ a modern (Mark II) take on push-pull topography and use 300B tubes in circuitry optimized for bass extension and improved vocal fidelity. The original incarnation of the Gakuoh—the name means “king of music”—was designed about 20 years ago but this updated version uses silver signal capacitors and parts, and has dual GZ34 rectification and a more robust power supply. These gorgeous amps are built to order and will be shipping within a few months of the Munich show. A brief listen to a piano and violin duet revealed a highly pleasing tonal balance with quite natural timbres, coupled with lively energy and nimble attacks. 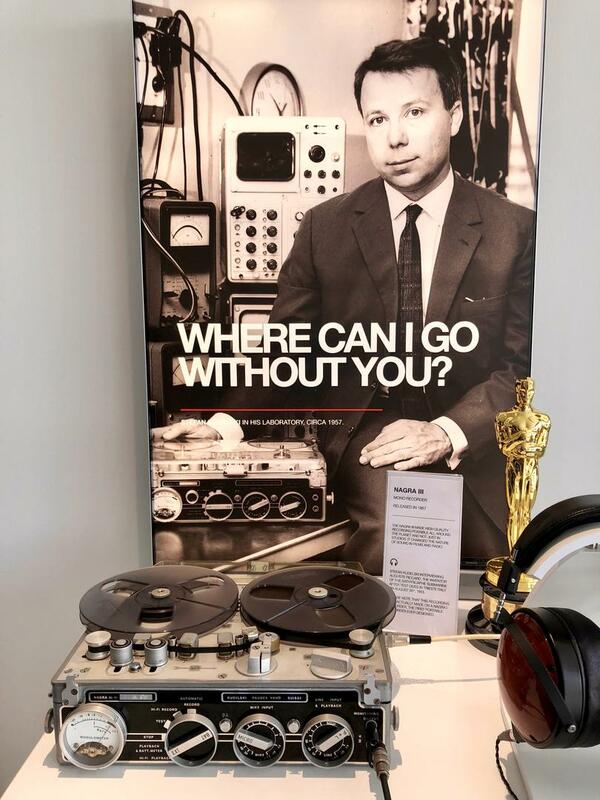 In addition to presenting a full demo setup of Nagra HD electronics paired with Wilson Audio Alexia II speakers, Nagra commemorated its 65-year anniversary with a multi-station exhibition showcasing the Swiss manufacturers’ innovative hand-built components through the decades. Each display podium featured a milestone product along with a description of its development and design. Most were also interactive: You could listen to vintage reel-to-reel tape recordings, turn the knobs and dials, etc. Another memorable and creative exhibit: In addition to displaying a plethora of its turntable offerings both new and vintage, Clearaudio celebrated its 40-year anniversary with a (do the math) 1978 Volkswagen bus tricked out with an audio system with a functional turntable front end. Wunderbar! The Audio Company of Atlanta reprised to great effect the same blockbuster system (with an Acoustic Signature Invictus turntable instead of a Kronos Pro) seen and heard at AXPONA: Von Schweikert Audio Ultra 11 loudspeakers ($295k) powered by two pairs of VAC Statement 450 iQ monoblock power amps ($295k/pr. ), VAC Statement Line Stage ($80k) and VAC Statement Phono Stage ($75k). Here I was able to have Leif Swanson fiddle around with the bass controls a bit as I listened to a few low-end-laden cuts from Sleep Well Beast. Perhaps what was most impressive was how such tweaks must have enabled this gargantuan system to be (more or less) adapted to play within a room at the MOC that was a fraction of the size of the AXPONA ballroom. Although I was not able to drop by the concurrent HiFi Deluxe show at the Munich Marriott Hotel, I’m familiar with some of Denmark’s Aavik Acoustics recent product launches shown there, such as its new U-150 integrated amplifier ($12k; options more) driving Raidho D1.1 speakers, and an Ansuz Acoustics Mainz8-DTC power distribution box ($20k) plus a full loom of Ansuz D-2 cables. Additional products from Michael Børresen and company will be forthcoming soon under a brand-new brand as well. Fine Swiss electronics from CH Precision were presented in at least two rooms (and almost certainly more) powering exotic loudspeakers: For one, CH’s C1 preamp and M1 monoblock amplifiers powered Göbel High End’s latest Divin Majestic, a uniquely designed floorstander. Bass was substantial and clarinet breathiness was, well, breathtaking. Based on the sounds I’ve heard from CH and Göbel in the past, the overall weight and heft of the presentation surprised me (in a good way). What I did expect (and heard) was a very high degree of resolution that didn’t skew clinical. In another super-sounding setup, CH Precision electronics—L1 line preamp and M1 stereo amps tri-amping—also drove Stenheim Reference Infinite loudspeakers with subs. A brief listen to some chamber music tracks (digital only) yielded air, speed, black backgrounds, and detailed accuracy—what some might call the Swiss school of sound. Yet the human element wasn’t lost; you could hear the intake of musicians’ breath between phrases, for instance. The magnificent 30th-anniversary Air Tight 3211 monoblock amplifiers at this show were paired with Wolf von Langa speakers (that nearly seemed to disappear) and once again delivered superb sonic delights: timbral purity and tonal realism shined along with smooth, effortless coherence and the illusion of 3-D presence of singers and instruments—Dean Martin’s rich baritone and Louis Armstrong’s infectious chuckles against slow blues clarinet—all rendered with plenty of bloom, resolution, and presence. 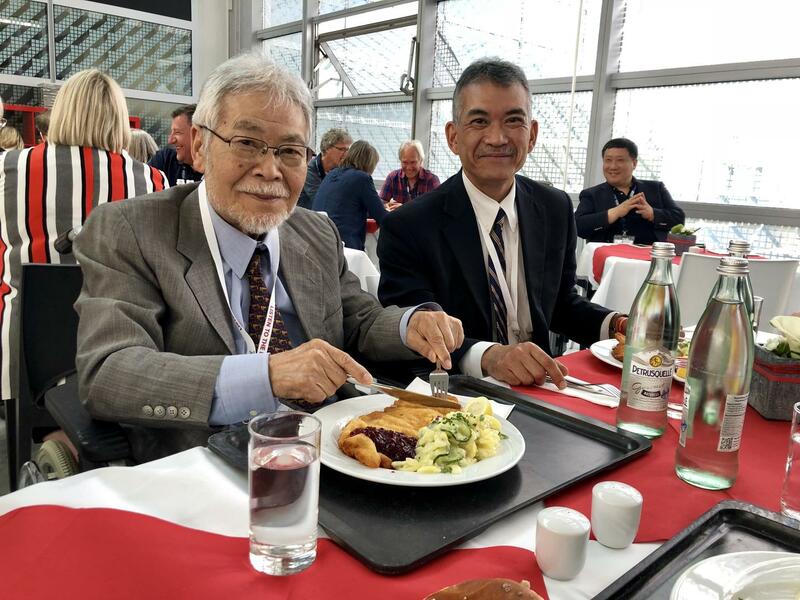 Air Tight’s legendary founder and designer Mr. Atsushi Miura attended the show alongside his son Yutaka "Jack" (both are pictured below), who is to be at the company helm. Stein Music room—clearly this ranks among those rare systems that serve all types of music well. MBL X-Treme with 9011 amps and 6010 preamp—I keep returning to these but the reasons why are sound: full-scale sweep and excitement when called for, balanced by unparalleled dimensionality and refined detail. Magico M6 loudspeakers driven by Soulution 7 Series electronics struck a wonderful balance between dimension and substance plus rapid-fire attacks and refined, realistic detail. In no particular order: Vandersteen Model Seven Mk II speakers driven by the latest Brinkmann electronics; Wilson Audio Alexia Series-2 speakers and Constellation electronics; Magico A3 speakers powered by Pass Labs electronics. The massive Dan D’Agostino Master Audio Systems Relentless monoblocks. Also the resurgence of Western Electric 300B tubes in a variety of new high-tech amp designs. So many companies commemorating their multi-decade anniversaries with special exhibits and limited edition models. Also, the ressurection of Western Electric 300B tubes. Anything from Stein Music; the Voxativ system chez moi; I’d also pair it with a turntable front-end.